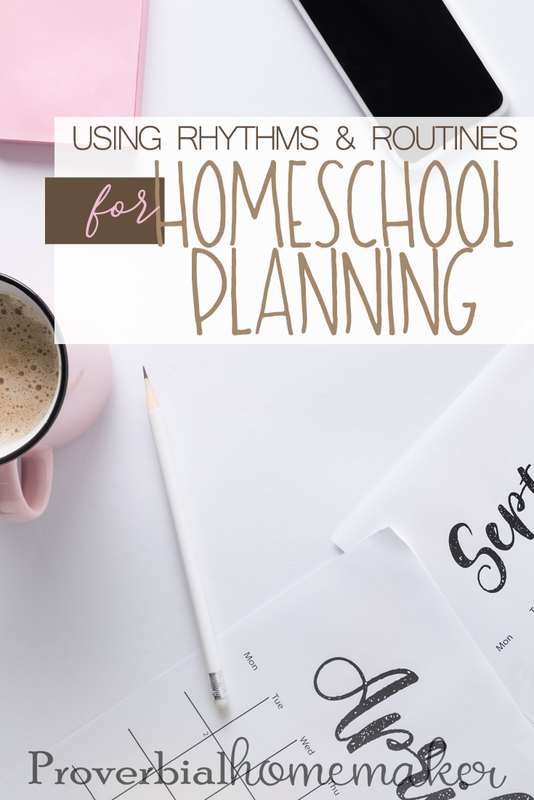 My husband and I have decided that year-round homeschooling is our thing (more on that another time). We already were doing that, really, but we made it official when I realized I needed to be a little more focused in planning. So this year, starting Kindergarten and Preschool for our kids in the Summer quarter, I decided to work on a method of getting my act together BEFORE the wee hours of crunch time. I’ve mentioned that we are going to do some Before Five in a Row (BFIAR) units to start with this year, and then do the full Five in a Row (FIAR) set of lessons. If you are looking for inspiration for planning these units, I highly recommend making Michelle at the Delightful Learning blog your new favorite. Turns out, she also has fantastic, simple ideas for organizing and planning all those materials! I’ve been getting many of my ideas from her. First, I decided to spend a good amount of time putting off some other nap time / evening projects (except for sleeping – NEED SLEEP BADLY) to focus on putting together as many of the upcoming units I could at once. I bought a cheap storage/filing crate at Target, assembled some file folders and tabs I had from other areas, and set up a file for each unit of BFIAR that we will be doing. In a few weeks, I’ll start setting up the FIAR units. In addition to the unit files, any big materials that don’t file well, such as counting bears and bags of buttons, are stored as long as I think I might use them again soon. When I planned the Corduroy unit, I just browsed Pinterest and other blogs that documented their BFIAR lessons to gather ideas. I went around the house gathering my materials and printing and laminating whatever I needed. Everything went into the Corduroy file. 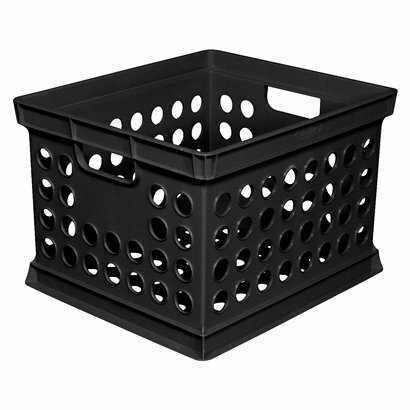 When we actually started the Corduroy unit, I put the contents of the file into a basket near our homeschooling space. That basket is designated specifically for the current week’s materials and any of the kids’ work that is in progress. Once the week was over, I just dumped the contents back into the unit file. 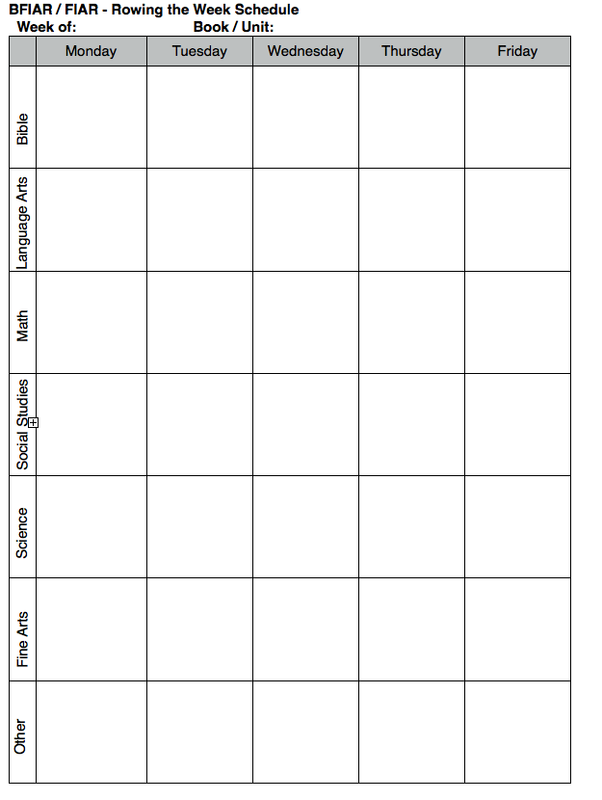 It works pretty well, but I soon realized I needed some kind of chart or document to fill out when planning each unit. I’d like to make sure I cover all the areas of the unit (Bible, social studies, math, language arts, science, etc.) and also have a way to divide them up among the days of our week so they’re balanced. I found an interesting BFIAR lesson planner on Pinterest but could not find a link that worked. Looks like that blog is gone now. So I used the thumbnail as a template to create a version I could use. It’s not earth-shattering, but it works. Although I generally am a technology gal, homeschooling is pushing me more and more into the paper realm (gasp!). I print out a lesson plan and fill it out as I’m planning the week and then stick it into the unit file. Feel free to print and use this however you wish. Here is a PDF, Pages, and Word version for you (the Word version has an extra blank page I can’t seem to get rid of… sorry). I have found that the lesson planner pretty much covers ALL the aspects of a week I want to cover, whether it’s BFIAR/FIAR-related or not. So it will become my standard weekly planner as I incorporate other themes and activities into our school. You may want to only do 2 or 3 days a week for planning. We did that last year and it was fine too. I noticed that regardless of whether I plan 3 days or 5 days, the work I planned gets spread out over all 5 non-weekend days as we work ahead or catch up as needed. I imagine this will especially be true as we ignore school work on days where playing outside all day in the nice weather is a better choice. And that’s totally fine. Right now we are finally hitting good weather, so I won’t mind if we do a week’s schedule over two weeks instead. Fill out the weekly schedule in pencil. Schedules are better when they’re flexible! Planning units ahead of time is great. Planning exactly what you will do on which week of the month is only helpful 3-4 weeks out. After that, you’re setting yourself up for failure. At least, that’s been my experience. I do have some ways to do longer-term planning that I will share later. Now that I have looked through the BFIAR and FIAR lesson books, I think you could do without the BFIAR book. The FIAR and Bible supplement books are more robust and I would buy them again, especially at used prices. I was told that there is a super simple planning sheet at the back of the FIAR book. I didn’t know this! I bought an older used copy but lent it to a friend so I could use her BFIAR, and didn’t notice a planning sheet before giving it to her. So you may want to check out the planner in any FIAR manual you buy! Awesome idea making your own. We have the newer version of FIAR and there is a planner in ours. 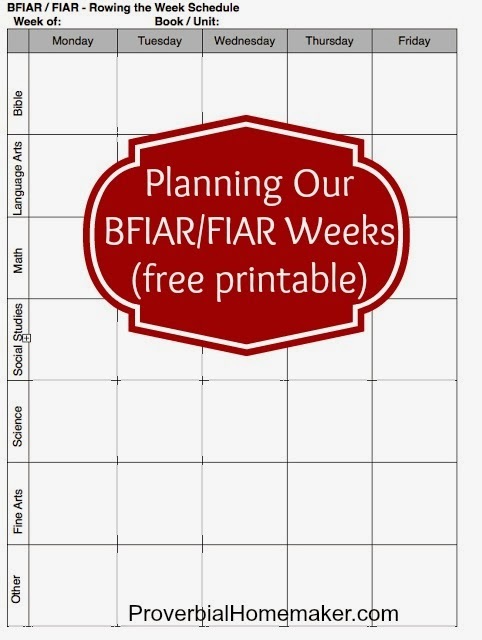 We too are doing BFIAR and FIAR and have blogged about some of it on my home ed blog http://buffysummers1831.blog.com there are also links on my page for lapbooks that can go along side these. Thanks so much, Tauna. Great ideas, helpful links, and very informative for a BFIAR newbie. I am stealing the planning schedule, too! Blessings to you!